Ariadne is a clever, courageous mythological figure – and a name that debuted in the US Top 1000 in 2014. This Baby Name of the Day post was originally published on May 9, 2008. It was revised in August 2010, and substantially revised and reposted on March 7, 2016. The original bearer of the name was a princess, daughter of King Minos. Their kingdom had defeated Athens in battle, and the price the victors demanded was steep. Each year, Athens was required to send seven young men and women for sacrifice to the Minotaur, a vicious half-bull who stalked his prey in a maze. When our story begins one of the fourteen was a spoiler – the valiant Theseus, who volunteered. Shades of The Hunger Games. But Theseus believed that he could kill the beast and end the practice of sacrificing Athenian youth. If not for the princess, Theseus would long be dust in the depths of the labyrinth. The princess lent him a suitable sword and a ball of red thread, so he could mark his path into the maze – and back out again. That makes Ariadne a hero name, too. Like many a Greek myth, Ariadne’s story ends tragically. But it’s oft-repeated in music and the arts. Richard Strauss wrote an opera about her, and there are poems and paintings and plays, too. In brief: Theseus abandons her. She marries the god Dionysius, and in some accounts, becomes a goddess, though a happily ever after proves elusive. Agatha Christie gave the name to a friend of Hercule Poirot, a mystery novelist who often assists Poirot in his investigations – though she’s not a detective in any way. In 2010’s Inception, Ellen Page wore the name. Her character designed labyrinths. 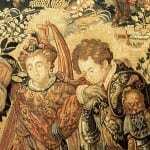 The royal family – Ariadne and her parents – are featured in the BBC’s mythological(ish) drama Atlantis. Something of the original heroine remains in the name. The name was used in the real world, at least sometimes. Around the year 500, the name was worn by a Byzantine empress. And there’s an even earlier Saint Ariadne, who died around the year 130 after refusing to participate in pagan rituals. The names’s meaning is straightforward: it comes from the Greek words ari and adnos -most holy. It’s the name of a butterfly and an algorithm, and there are other references throughout the natural world. We’re wild about Greek ends-with-e names for girls, like Zoe, Chloe, and Penelope. 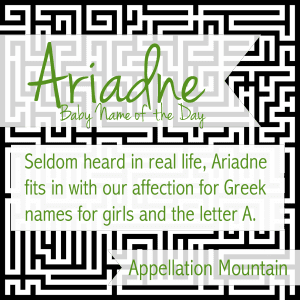 We love A names for girls, including several that are close to Ariadne, like Adriana/Adrianna. The Italian form of the name, Arianna, and the related Ariana, are both Top 100 choices for girls in the US. In fact, the single ‘n’ spelling was one of the 25 fastest rising names for girls in 2014. It’s also the name of popular Mexican actress Ariadne Diaz, who had a big year in 2012 and 2013, starring in telenovela La mujer del Vendaval, and followed it up with more television work in 2014. In 2014, the name entered the US Top 1000 for the first time ever. Credit the combined force of a popular Spanish-language star, our affection for Greek names for girls, and the ongoing interest in A names for our daughters. It suggests that Ariadne could be a mythological name to watch in the coming years. What do you think of Ariadne? Would you consider it for a daughter, or do you prefer Ariana/Arianna? My first daughter’s middle name 🙂 my favorite name since childhood. I LOVE Ariadne – love it as in potential next daughter love it! I love the sound, the mythological background (positive, for once – hurrah! ), the equally positive pop culture references (also rare! ), and how unbelievably underused it is. My only hesitation would be that I already have a little Juno. What do you think: is Juno and Ariadne together just too much mythology… or too much Ellen Page?! Clever, feminine, four syllables… Love it. Perfect sister for Phoebe and Daphne. Other variations on this name are Ariann (my name, the British version), Ariane (French), and Ariadna (Spanish). I have often gone by Ari. I have always hated my name, it is such a pain to spell and everyone says it wrong, but I think I might have loved being an Ariadne or Ariadna. Been utterly in love with Ariadne since she was first encounters in my children’s book of Greek Myths, and I’m predicting an upsurge in popularity if Atlantis get more than one series. I hope not too popular though because the whole reason my first daughter will be named that is because it is strong, feminine and unusual! In the generic English accent it is wonderfully crisp and interesting. I am currently completely in love with Ariadne. I love the nickname Ari. * I don’t know why I knew this… except to say I loved that show when I was a little kid. That is a fabulous fact, Julie! I just looked it up and Ellen Page IS Ariadne in Inception. It’s a highly appropriate name for her character seeing as her particular job is to create the mazes within which the inception takes place. Oooh … thank you, thank you, thank you! I haven’t seen Inception somehow … totally missed that. Like it! Very girly and original… My husband and I love mythical names… while we have no children yet, I am always trying to find new and beautiful mythical names to add to the list. The downside to this name would most definitely be the pronunciation of the name, not to mention she would be forever called by a nickname i am sure. With our last name always being mispronounced, I try to steer clear of first names that are very mispronouncible. I fear that in Texas, the pronunciation would drift to Airy-Odd-Knee or Airy-Add-Knee. You remembered right, Fran! But that doesn’t dampen Ariadne any for me. I mean, Ariande’s miles better than say, Bliss (her character name in that roller derby flick)! I firmly like Ariadne and think I’d fawn all over the mother of one. I’d love to use it myself but Leo, Simon, Josephine & Ariadne? I don’t think so. Well, that and I doubt #4 will ever happen now. Yikes – I wonder if the parents naming their children Aryana have considered what the name looks like without the final “a”? 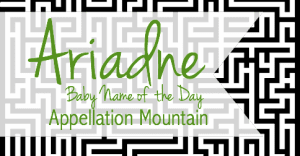 Ariadne is a cool name but I can’t imagine it on an actual kid. correct me if i’m wrong but wasn’t this ellen page’s character name in inception? the pronunciation was hard to make out but it did sound very similar to this if it wasn’t! I like Ariadne and would be much more inclined to use her than the overused Arianna, etc. In Agatha Christie’s Poirot mysteries there’s an Ariadne Oliver who appears in a number of stories. This used to be in my top names. I still like it, but am not sure if I’d still use it. I also liked the Polish version of Ariadna. Aerianne … yikes! Mythological names can be tough to wear, but at least when we don’t recognize them, it’s a gap in our knowledge – not because the name was pulled from the ether. It might not make kindergarten easier, but I suspect by freshman year, it’s less of an issue. Assuming, of course, that your mythological namesake was more or less decent and well-behaved. I love Ariadne a kazillion times more than Arianna or Adriana. I knew an Aerianne in high school. That girl was miserable! Pretty, but she’d be doomed to a life-long pronunciation battle. […] – Just like favorites Arianna and Ariana, this one traces her roots to the mythological Ariadne.